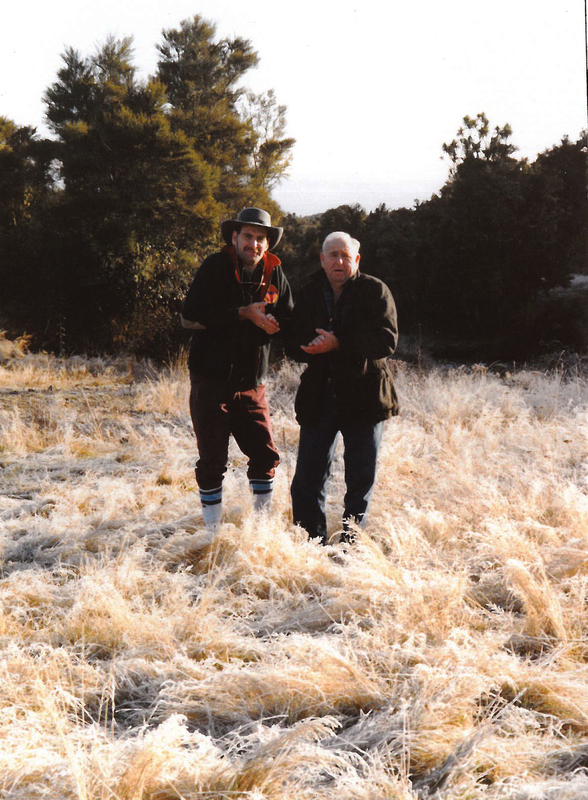 Up until the late 1990’s it was possible to go fishing inside the Hautu prison farm near Turangi. It generally was necessary to apply for permission to do so in advance. Once it was granted you had to front up at the Guard house for inspection on your allocated day, before a permit was issued. The prison authorities divided the river into a series of beats and each beat was allocated to an angling party for a day. It was all so very English. 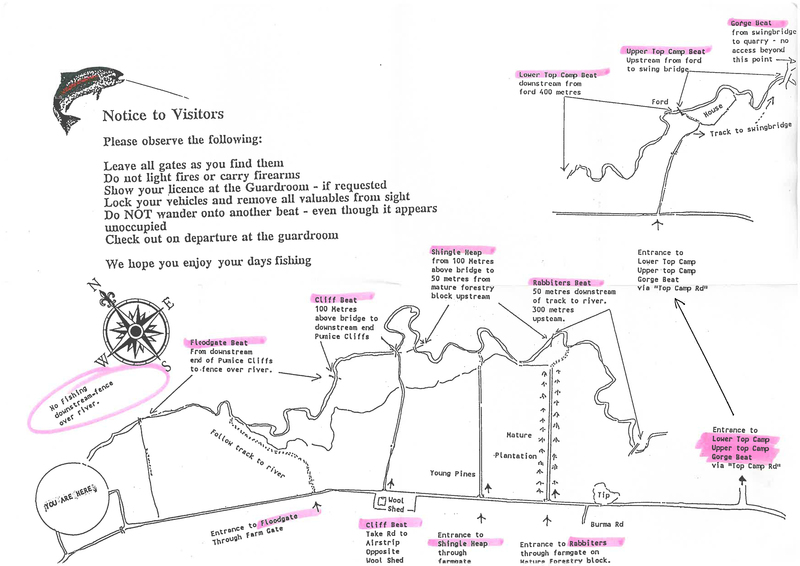 I’ve attached a photograph of the river map showing the beats so you can see just how organised it was. 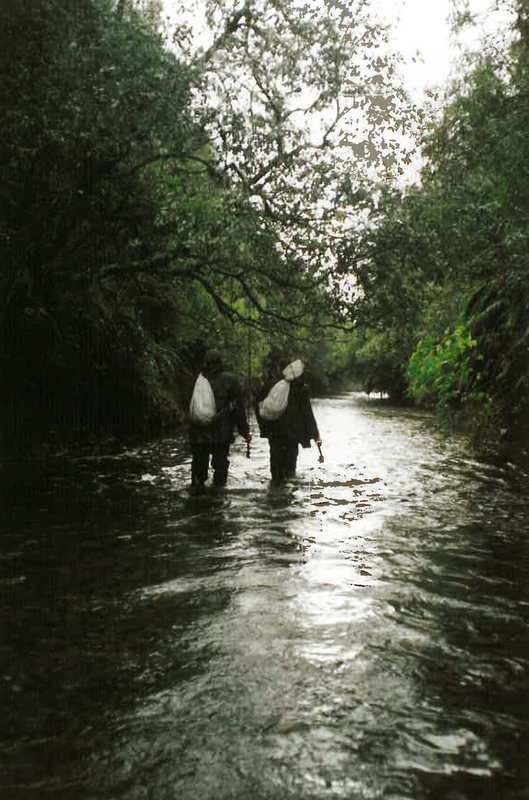 The Waiotaka River runs through the Hautu prison farm and it is a major Taupo spawning tributary. 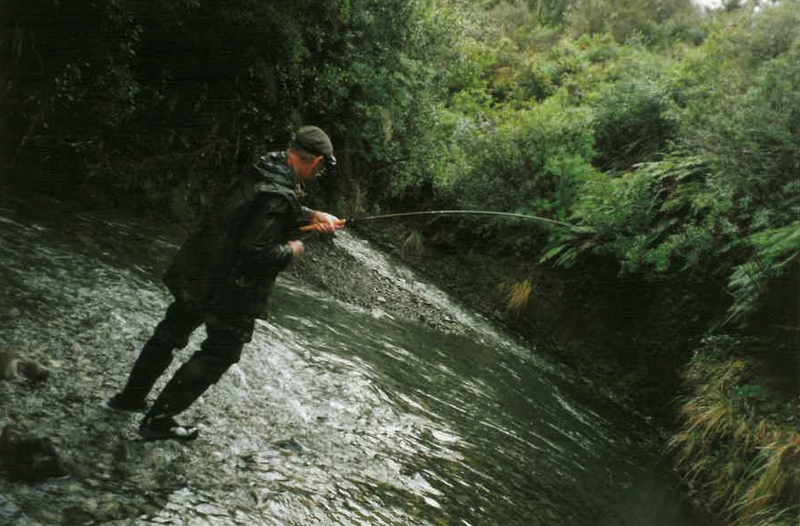 A lot of fish run up the Waiotaka to spawn and if the stars aligned then the river would often be awash with trout. 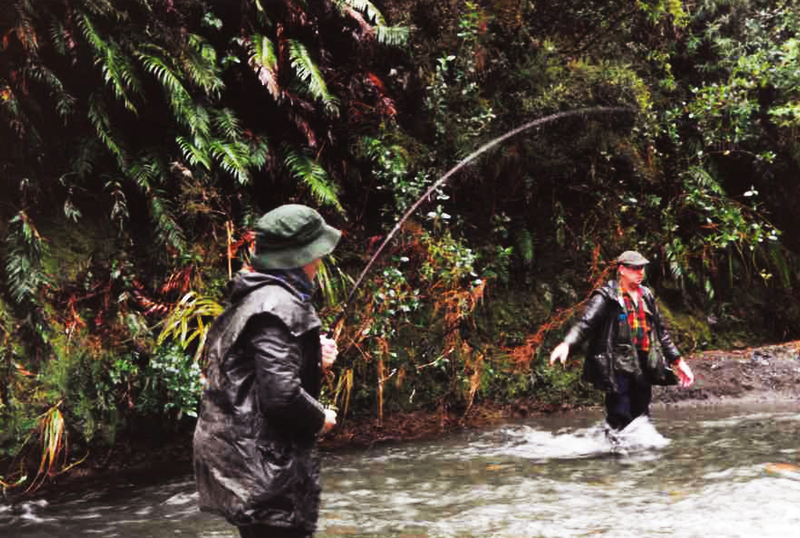 We fished the Waiotaka in late May every year for 25 years and got to know the river very well. 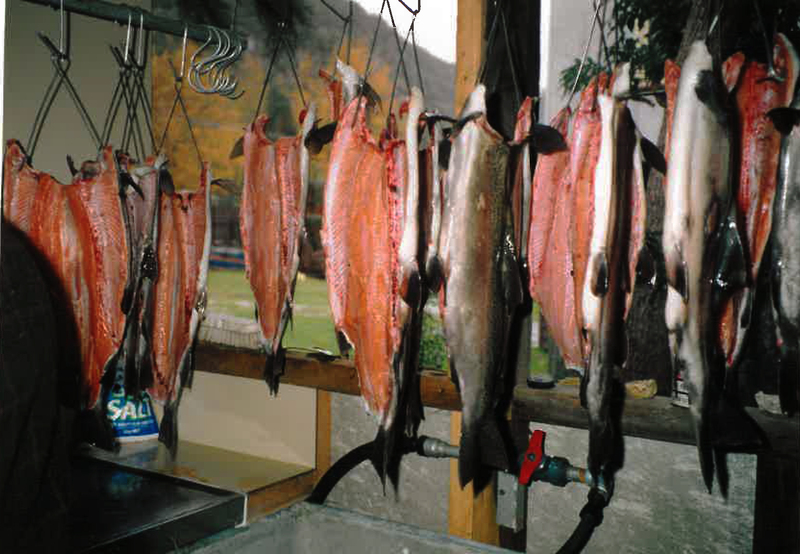 The upper river beats, Gorge, Upper and Lower Top Camp were highly favoured by anglers as they tended to hold the largest numbers of trout. There also was a large wooden house near the upper beats where visiting dignitaries tended to stay (it was rumoured the royal family did this once) and focus on the prime stretches in total seclusion. The highest beat that we tended to get allocated was the Lower Top Camp. However, every once in a while we were fortunate enough to get allocated the uppermost Gorge beat and this was always an eagerly anticipated bonus. What follows is an account of one memorable session in the Gorge for Ivan (my father), Sandy (my wife) and I. The morning dawned still and the sky was cloudless. A heavy blanket of frost smothered the grass turning the taller blades into a sea of ice encrusted needles. The mercury in the thermometer was glued deep into to the area with the minus sign in front of the numbers. We were up at 5.30 am had eaten breakfast and ready to go by 6.00 am. Even with warm water it was difficult to get the ice off the car windscreen so we resorted to scraping. It was a short drive to the Hautu Prison farm from Turangi and we were through the Guard house in record time. The sun was up but if anything the temperature seemed to get colder the closer we got to the river. As you can see from the photograph, the grass in the car park looked like it had been sprayed white. It was not just cold. It was frigid. Every time you exhaled you generated a gaseous plume that the Kingston Flyer would have been proud of. We quickly donned our Neoprene waders and extra woolen layers to stave off the bitter chill. The extra layers didn’t seem to have any effect and within minutes extremities were numb and useless. We assembled our rods, fumbled the fly line through the guides and attached a weighted Glo-bug and a weighted Hare & Copper nymph to the end of the tippet (in standard truck and trailer fashion) before setting forth to the river. The heavy frost had reached everywhere. Even the riverside shingle glistened white. Unfortunately the dense bush canopy was doing an excellent job so the river was still bathed in shade. We carefully approached the first pool from below on hands and knees and parted the ice encrusted grass curtain to see if it held trout. The river entered the pool at 2 o’clock, hit the far bank and headed downstream directly towards us at 7 o’clock. The eye of the pool was choked with trout, jostling for position hard up against a shingle lip. Ivan, who habitually was always first to cast, entered the tail of the run and roll cast his flies into the rapid which fed the pool. Within seconds of plopping into the confused water they reached the shingle lip and dropped into the eye where the Glo-bug was promptly monstered by a feisty rainbow jack. Ivan struck, the fly line sprang taut with a hiss and the fish took to the air. Up, up it arched before twisting and belly flopping back into the strong main current. This forced it back into the deeper body of the pool where it went ballistic. It charged up towards the eye before being checked and drawn back with the powerful 7 weight graphite fly rod. This “to-ing and fro-ing” was repeated a couple of times before Ivan was able to apply side strain and eventually draw it back into the tail for beaching. Four pounds of glistening silver with a brush stroke of red down its flank from gill plate to vent. Deep and stocky, it was a spectacular specimen. We’d only been on the river five minutes and we’d landed our first trout of the morning. Ivan then left Sandy and I to it and headed off upstream at a canter. We fished on and both of us managed to land a similar sized trout in short order before the trout wised up and dropped deep, out of reach. Three fish on the bank within twenty five minutes. What a start to the day. It was still bitterly cold in the shade so we opted to follow Ivan upstream in an effort to find some sunlight and get warm. We caught up with Ivan several pools upstream, just as he was beaching his second fish for the day. In this sort of mood he was an angling machine. Moving from pool to pool hooking and landing fish, seemingly at will. This pool also held trout but it was much smaller. The commotion caused by landing the first trout had driven the remaining fish deep in amongst the drowned Manuka saplings adorning the rocky bottom of the pool. We tried to extract another fish but only end up losing flies to Manuka branches. Losing two flies at a time is an expensive business so we opted not to continue fishing this stretch. Moving upstream fish were visible in pairs busily spawning in the shallows. We by-passed these fish and tried to find larger pods of trout holding in the deeper pools. Eventually we did find another holding pool about ¾ of a kilometre upstream. The water entered the pool at nine o’clock, hit the far bank and exited it at four o’clock. Again the trout were holding station behind a shingle lip where the current entered the head of the pool. They also were lined up Indian file against the far bank hugging the bottom close to the seam where the bank met the bottom. There must have been 20 fish visible in the gin clear water. It was my turn to go first so I lobbed my tandem rig well up into the shallow, rapid section feeding the pool so that the flies would sink deep as they headed downstream over the lip. I could see the Glo-bug heading downstream but it was the small Hares ear nymph which was hammered by one of the trout queuing to head upstream. It shook its head in anger, turned tail and headed downstream in a flash. Line was pouring off the reel and the rod was bent into a healthy curve. The reel handle was a blur and it whacked my still frozen knuckles as I tried to gain some control. “Blood my dear Nora”, I exclaimed. Within seconds it had left the pool and was halfway down the next run, me in hot pursuit. I finally caught up with the fish about 50 metres downstream and was able to get below it to halt its progress. It then headed back upstream but not too far as it was nearly spent. By now I was panting heavily in my woollen and neoprene cocoon and could sympathise with its predicament. This was a nice rainbow hen of about 4 ½ lbs, again a short and stocky bar of silver. Sandy and Ivan persevered in this spot and both managed to land trout before they again got wise and everything went quiet. Above this pool was a long glide that was completely shrouded in bush. In fact, the mature bush on either side of the river actually enmeshed to form a tunnel of vegetation that blocked out the sunlight. It heralded the start of the walk into the gorge section. We sat in the sun for about 10 minutes to warm up before re-entering the shaded tunnel to head into the gorge. As we headed upstream we were continually disturbing fish, some that were spawning and others that were just holding tight under the bank in deeper pockets. The dark tunnel seemed to go on forever but in reality it probably was only 100 metres. As we neared the end the sunlight started to stream through gaps in the canopy and we could finally appreciate the beauty that surrounded us. The banks were covered in native ferns and higher up large podocarps dominated the skyline. Native birds were enjoying the sunlight, especially the white wattled tui which were gurgling and chortling their approval. Wood pigeons crossed the river from bank to bank; their powerful wing beats sounding like the thrum of a low flying helicopter. A beautiful pool occupied the opening at the head of the tunnel. The river entered the pool at 10 o’clock, hit the papa rock bank and exited at 6 o’clock. There was a small eddy at the eye of the pool on account of the steep angle of entry. As we gazed upstream it looked like the pool was barren. The bottom appeared dark and foreboding. Disappointed, Ivan roll cast his Glo-bug combo into the current at the head of the pool in the hope that there was a stray fish present. What happened next will live with me forever. The “bottom” parted like the proverbial Red sea as the tightly packed trout shied away from the flies. Where the fish parted a grey-white papa shelf was suddenly evident. One of the trout seized the Glo-bug and gyrated angrily as Ivan set the hook. The remaining 120 fish gyrated in sympathy and tore around the pool to avoid the hooked trout which by now was going aerial and making a real nuisance of itself. Ivan soon managed to get it under control and draw it to the tail for me to beach and despatch. It was a lovely jack rainbow of about 5 lb. Long but well proportioned. Red flanks glowing in anger. The next two hours flew by in a blur. We all landed many trout and lost as many as we landed. As you can see from the photographs, it was a truly beautiful pool to fish. In the end, we decided enough was enough and headed back down the tunnel well pleased. Even though we saw plenty of fish on the way back to the car it would have spoiled the day to fish for them. We knew we had just experienced something truly special, just the Gorge and us. Back at the car we sat in the sun, quietly devouring mugs of hot soup and slices of cold buttered toast. The soup was heavy on meat and vegetables and typically light on liquid. We called it “Marley’s ghost and loop da loop” as it is known in Cockney rhyming slang. Not a lot was said as we were all locked in our private thoughts. Each savouring what had just happened in their own unique way. It was a truly astounding morning.